I opened my sleepy eyes one summer morning and looked outside. My bedroom window opened straight in the garden and I could see the lavish greenery, blooming flowers and chirping birds right from my cozy bed. My eyes wandered with a tiny sparrow chirping and hopping from one branch to another. It was on it’s own. As if it didn’t bother of anything and just wandered alone singing it’s own songs and loving her own company. Flying rhythmatically it sat on our iron gate. It appeared so tiny there but somehow blended with the grayish-black rusting gate. The sparrow sat there for a minute, twerked her head for a while and flew away. Might be she remembered her daily duties and took off to accomplish that? It was then, when I suddenly noticed, how ordinary the gate looked. Of course, it had the charm of standing there since a decade. So what it has started rusting a bit? So what if it makes that cracking sound when opened? So what if it has deformed from places a bit? It still is the gate I would always love to open and come back in my this house. The house which gave me an identity, solace and unconditional love. That’s the door which leads me to my heaven on earth. But, still my heart cringed for something. It was time to leave the bed and my thoughts, so that’s what I did and got totally lost in my routine life. The next morning, I woke up to the chirping again. But today, it was different. It was more robust. It seemed happier. I hastily opened my eyes and felt the garden looked more alive today. There was this sparrow meeting happening and everyone seemed too excited to put their views forward. I wondered if it drizzled a bit in the morning. The leaves in the garden looked fresh and danced with the wind. The colorful bougainvillea flowers too were clean, fresh and danced rhythmically today. I guess the meeting ended on a very happy note. Everyone seemed so excited and content and flew together and sat on the iron gate again. My sleepy eyes opened wide. The gate was painted in a cool blue color. It didn’t look ordinary any more. It looked so extraordinary suddenly. It radiated energy, happiness and coolness all around. It looked so fresh and radiant. My heart swell up with happiness. I ran towards the gate to have a closer look. The gate was mended and painted. The swirls and climbers around it looked happy and great too. The sparrows were still sitting there chirping loudly. It seemed they wanted to tell the whole world how happy they were today. Their happiness was spreading like the sun’s beam on a dark spot. Enlightening everyone who came it’s way. Soon the gate was full of more sparrows, parrots, mynas and other colorful birds chirping loudly and hopping in excitement. I wondered what was the talk about? I realized on that day that any ordinary thing can be made into an extraordinary element. It just need some patience, hard-work and tons of love. Anything can be achieved and can be given a new form and life if one has perseverance. Growing up in a small town, I saw and imbibed that in myself. I saw my grandmother and mother trying to make extraordinary things out of ordinary stuffs. No internet and not much ways of transferring or gaining knowledge yet they knew a lot. Everything was passed down from generation after generation. The quest to try, the zeal to learn and the willingness to fail and achieve. They always surprised me of their creativity. I am happy and feel blessed to have learned things from them. It is a blessing which can be passed on to another generation. And I thrive to do the same. When my mom got married and came to my father’s home, she brought with her all the wisdom and knowledge which my Naanima (maternal grandmother) passed on to her. Along with her side jewelries and dresses she also brought her mother’s cuisine with her. That was the charm. Two families coming together. Both from the same state but a totally different way of food preparation, ingredients and taste. My folks never believed in wasting food. I remember eating lots of curries made out of peels, flowers, leaves and young branches of different vegetable plants/ creepers. 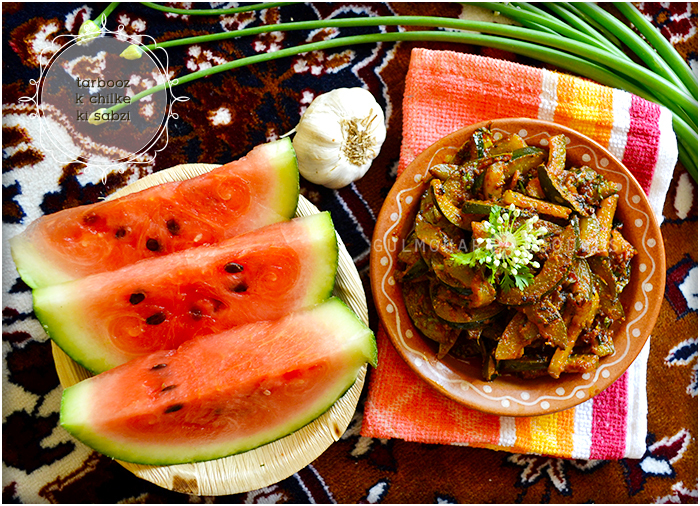 It was my mother who started making the watermelon rind dry curry and even when people retaliated in the beginning, they soon started looking forward to it. It was a big hit at home. Summer meant “tarbooz k chilke ka bhujia”. Everyone loved it. Of course we made murabba out of it too. But, the bhujia remained my favourite. Who else remember the onset of those dreamy winter mornings, when the world seemed covered in a lazy, chilly, misty blanket. Where the soothing green grass slept lazily wearing it’s beautiful dewy diamond dress, glittering merrily in the sunbeam’s tryst. The calm mornings, where the socks clad feet would be tightly wrapped around the soft, thick double blankets.The never-ending quest of warming up by blowing air out of the mouth and soaking it up quickly in those colorful gloves filled hands. When the chilly air sent shivers down the spine and the constant struggle to keep ourselves warm. Days when the hardest thing seemed to be saying goodbye to that comfy, warm blanket and start the day. The days would start on a very hasty, lazy note. But, the eyes always glistened seeing those baskets full of fresh, colorful picks from the vegetable market. Winter brought colors to the kitchen and in our lives too. Remember those lovingly hand-woven colorful shawls and sweaters? That was love. Pure love! Those were the days when each season brought with them a totally different produce. Back then, there were no air conditioned supermarkets around selling exotic vegetables throughout the year. We had to wait and then taste the yummiest seasonal produces. Each season added their own beauty. 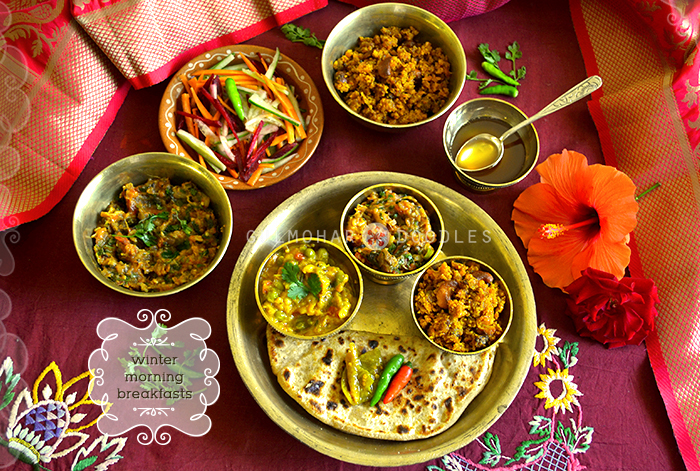 Each day the kitchen saw the burst of colors amalgamating beautifully in the carefully, skilled cooking. Oh, how I loved those days. Winter was the time for comfort, of warmth and for good food, for the touch of a friendly hand and for the talk beside the fire. It was the time for home. It was the time for rustic recipes. Amidst all those different delicacies, what I looked for the most was the humble “aalu ka jhor”. 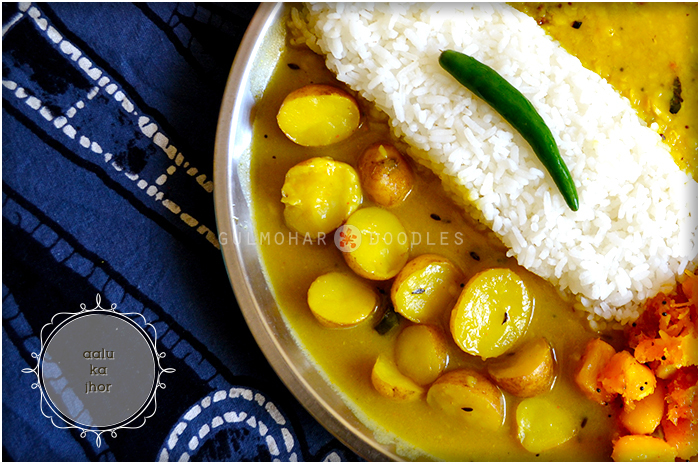 This piping hot baby potato gravy generously poured over the ghee laden rice tasted nothing simple. It was pure heaven on earth. It tasted of the hard work of the farmers, it tasted of the simple joys, it tasted of togetherness, it tasted of rustiness of my village mud. It tasted of my roots. Roots which have lost in the transition of time, roots which were replaced among multi flavored and complicated ingredients. Roots which are struggling to be held and given the respect it truly deserves. So you see, each time when I paraded to the vegetable market holding one of my parent’s hand, those baby potatoes never failed to bring a huge smile on my face. Those tiny, round, brown babies knew it can brighten any gloomy, dark, winter days. My old folks always believed in the magic of fresh harvest and fresh produce. No vegetable was tucked inside the fridge and left over to become dry and tasteless. Everything was cooked fresh either right from our home garden or from the vegetable vendors who brought the produce from their fields early morning. Aalu ka jhor was cooked during lunch at our home. When the chilly mornings were over and the breakfast was already sorted out, Maa and grandma would sit in the garden together laughing and chirping like sparrows cutting a big basket of these potatoes effortlessly with a sickle. Lunch was always a grand affair. But somehow, whenever aalu ka jhor was cooked, the other stuffs were kept to its minimal. Nothing fancy on those days. Just the humble potato curry and rice. Might be a stir fry on the side. I remember coming back from school tired and hungry. And when Maa served lunch, I couldn’t contain my happiness seeing this bowl full of sunshine. It was comfort, it was pride, it was love, it was contentment. This gravy is nothing ordinary. The baby potatoes were shimmered in a thin freshly harvested and pounded rice paste with loads of garlic. Not much spices just the humble basics. Winters, when time and days seem gloomy and cold, little things can bring joy and happiness to life. We just have to look around, dig deeper and listen to our heart. Imbibing the generosity of nature and trying to come a bit closer to our roots can create a huge difference in our lives. Try to teach your kids and make them believe in what touched your heart once. Show them the cultural roots. Might be they won’t feel the same emotions but we can try. Isn’t something better than nothing always? On this note, sticking to my roots and trying to create magic and memories together, I wish all my readers a Merry Christmas and a very hearty, welcoming, generous and loving year ahead. Be blessed, stay blessed! ❤. ♡. ♥. Soak the raw rice in little water for half an hour. Wash and cut the baby potatoes in halves. Do not remove the skin. Now, switch on the gas stove. 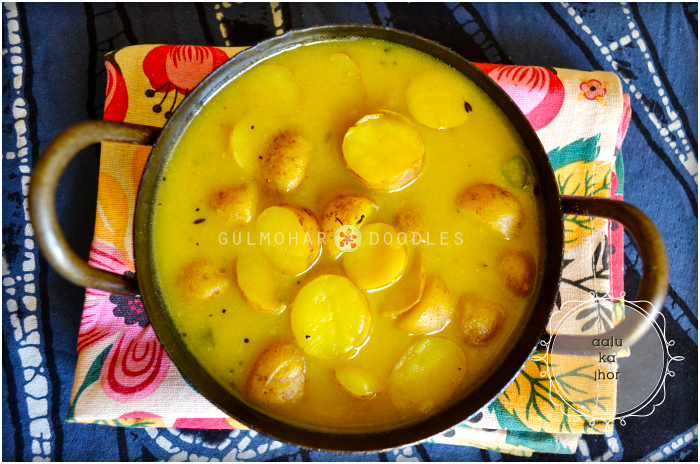 In a pressure cooker, add all the potatoes, one glass of water, 1 tbs of salt, 1 tsp of turmeric powder and close the lid. Let it cook for 10 minutes or till the potatoes get cooked but is not mushy. While the potatoes are getting cooked, grind the soaked rice in very little water. This mixture needs to be coarse and not fine. Take it out in a bowl and add half cup water to it and set aside. Coarsely grind the garlic pods and the green chillies in a mortar-pestle. Set aside. After the potatoes get cooked, take out the pressure and set it aside. Do not throw the water. Lit the stove and put a wok on it. Best to use an iron one since it gives a very rustic taste to the dish. Add a spoon of mustard oil into it. Once the oil gets heated up add the cumin seeds and watch it dancing in happiness. Reduce the flame and add in the chilli-garlic paste. Cook it for 30 seconds. Then add the cooked potatoes along with the water it was boiled in. Add the ground rice paste to it and let it shimmer in low flame for about five minutes. Adjust the consistency of water and salt at this time. I generally add half glass of warm water at this point of time since I like my curry to be on the thinner side. Also mash couple of the potatoes for a better consistency. Add in the coriander powder and let it cook happily for about ten minutes. Keep stirring the curry in intervals since it has the tendency to stick to the bottom of the cooking vessel. Once the curry comes to a boil, give it extra five minutes to soak in the flavors. Switch of the gas and cover the curry with a lid. Let it sit for ten minutes so that the potatoes imbibe the rice flavor. It was a blazing hot summer afternoon. I was fumblingly wrapping up the clothes put outside for drying in the morning while tiny sweat drops lazily rolled down my forehead. I turned my head and saw the happily dancing newly blossomed white jasmine flowers and my heart swelled up with pride and contentment. I lovingly bent over to caress and smell them for a moment when my eyes caught up seeing a young couple in the nearby shop. The nervousness of meeting in the most secured and safe hours, the excitement of seeing your love amidst the fear of getting caught. That tender love which can lift you to cloud nine in just a whiff of your lover’s perfume. The lover’s smirk, the rolling of the eyes, hastingly running your fingers in your hair and then nervously whimpering for things which you don’t even know why and what you want it for? Isn’t young love so pure and cute? You know it won’t last (mostly), you know it is just a phase yet you fall for it. But, when you grow older and wiser, maybe one day, doing the most random things, you might catch up seeing a younger version of yourself which can leave you lingering with sweet maybe funny memories of your own days? When I was in my teens, there was a small grocery shop near our home. I still remember those nervous tinkling eyes and the stammering voice which always asked for 100gms of Sattu from the shopkeeper. I wasn’t sure whether he liked eating Sattu that much or blurted it each time just because his brain somehow knew it was affordable and healthy! I wonder how many kilos of Sattu he would have bought just for a glimpse of his love. My vague memory remembers his mom complaining about finding packets of Sattu in random places of her house and I guess this caused so many Sattu delicacies often trips to our home . Both Bihar and Jharkhand, strive on Sattu. It is still one of the most sought out food there. Apart from being really healthy and nourishing, it is very fulfilling and easy to prepare too. I can not fathom anyone from there who would not carry a packet or two of this while travelling outside the state :). A variety of dishes are made from this humble soul. Litti, Sattu ka sharbat, Sattu ka jhor, Sattu ka paratha and Sattu ki kachori to name a few. You can even find random joints selling a combination of Sattu ka sharbat and sprouted brown or green chana (chickpeas) early in the mornings. A semi dry preparation of Sattu along with chopped onions, green chilli, finely chopped coriander and mint leaves, pinch of cumin-pepper powder and salt too is a morning breakfast favorite among the locals during the scorching summers. Winters are reserved for hot-piping Sattu parathas along with kheer, coriander-tomato chutney and some homemade pickles. Nights when the weather becomes really cold, the members of the family get together, play antakshari, lit up charcoal and bake themselves some delicious litti and chokha. Some days it could be teamed up with a spicy garlic chicken. Sattu was a saviour even during our 4:00am morning schools during summers. A quick stir of sattu ka sharbat and we were ready to go to school with a full stomach. I have loved the humble Sattu in all its form. But, Sattu ki kachori has been my all time favorite. It is my childhood love. It is nostalgia. I remember going to my grandmom’s house and among lots of other delicacies she wouldn’t bat an eyelid to cook these lovelies for me in breakfast. I would wake up with a big smile on my face smelling the aroma of these kachories being deep fried in coal stove. The smoke, the atmosphere, the busy mornings, the mist, the shared laughter and the feeling of being loved, together, has created magic in my head. I can still sit and think of those times for hours. So you see, every time I go back home, I ensure, rather goad my mom to make a couple of these for me. Those perfectly round fluffy beauty can lift anyone’s mood in a jiffy. The aroma, the crunchiness and the taste can keep on lingering to your soul for years. I never thought that one day I will be sitting and writing down my journey of nostalgic, rustic and might be forgotten food/ recipes of my state. The state which has given me a lot. It has given me my identity, has taught me to admire and protect nature, ignited my love for food, helped me in finding happiness from the smaller things in life and inculcated in my soul to try and be content with minimalism and not to forget to love unconditionally. How could I not think of returning it at least a portion of the favor it has showered on me throughout my life? Jharkhand food is not very popular yet. One can rarely find any authentic Jharkhand food/ thaali even while visiting Jharkhand. I personally believe that it is because of the lack of tourism and demand of the local food there. And also the local people’s belief of always eating freshly home cooked food every day, every time. It is still a rarity that people would go out and eat any meal. Of course, this fact has been changing with the new generation. But, the point here is that even when people go out to eat food, they don’t want to eat the same cuisine which they prepare at home everyday. They want to eat something different. And hence, seeing the demand it is almost impossible to find a joint/ restaurant/ eatery which serves authentic Jharkhand food. Listening to the radio today, I got to know that the world is observing International Mother Language Day today. Till date I was unaware of any such day of celebration. Isn’t it fascinating to know that such a day exists? A day to cherish and know the simple pleasure of the comfort of speaking in one’s own mother’s tongue/language? The language which gives you an identity. The language which would always be closest to your heart. The language in which you will think and dream. The language in which you would love! My mother’s tongue/language is Magahi (a dialect of Hindi). But, she always taught us to speak in Hindi. That was a language I grew up listening, talking, feeling and believing in. Somewhere in this process, I believe we forgot our roots. The language which was there long before we were born. The language which was a lever to all the community connections. I struggle to speak in my mother’s dialect today. Because, I somehow can not relate to it. This makes me sad. The reality today is that I can not fathom to teach the same to my daughter. And thus I know, that the chain is gonna break and the language will die a very slow death. It is heartbreaking. Hindi is my mother language and my husband’s is Tamil and we live in a place where Kannada is spoken. 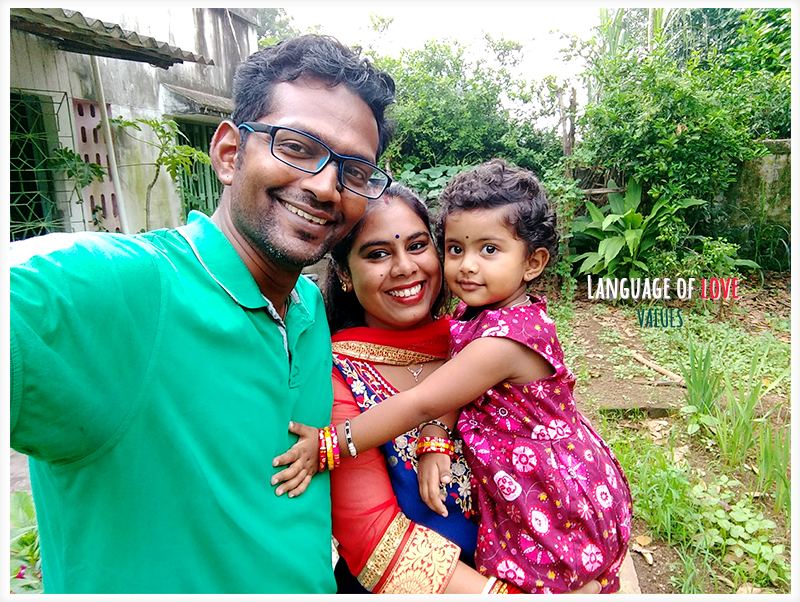 We are raising a daughter who seeing and listening to her parents conversation unknowingly has considered English as her mother tongue. It’s not her fault neither is ours. I am raising a confident kid. A kid who I know would learn a mosaic of languages soon. 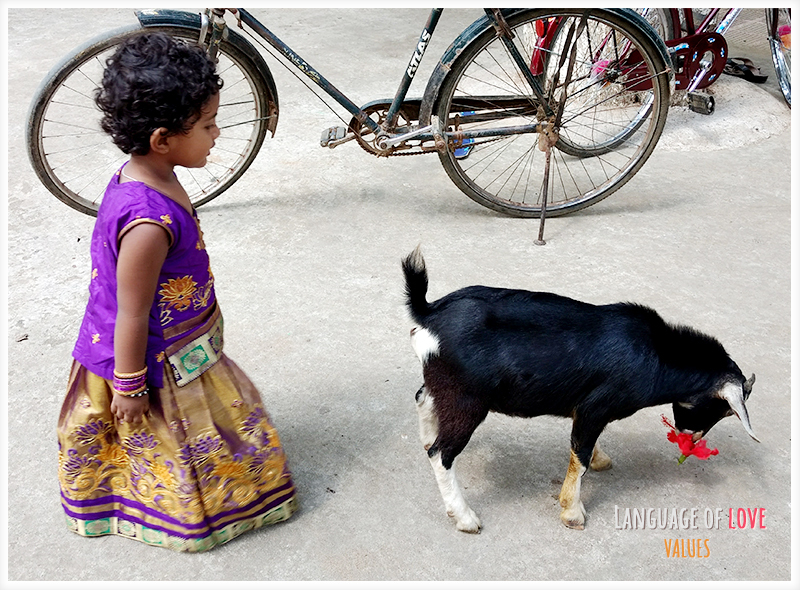 We as parents, want to inculcate in her that no culture or language is superior than other. Embracing the diversity of our country and living in harmony choosing whichever language she wants and living a happy life is all we wish for her. 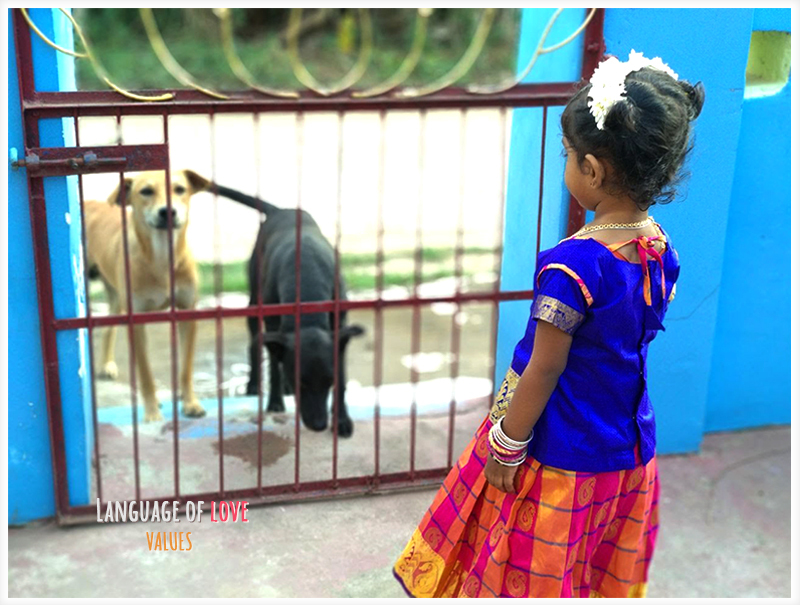 Among all these, what we wish the most for is that she listens with the ears of tolerance, see through the eyes of compassion and chooses to speak in the language of love. How beautiful that would be! These lovelies bloom early in the morning unlike us, when most of us are hiding ourselves under those warm, cosy blankets, snoozing the alarm clocks, pulling our feet a bit more closer to our chests. They salute the rising sun with a dance of excitement, each and every day, till they live. Those magnificent golden beauties bring the message that the festivals are coming. The good times are almost here! Are you ready to welcome them? Most of the festivals which I can think of had these lovely flowers adorning our house, Puja rooms, courtyards, cattle and sometimes our neck or head too 🙂 Those times had a charm of it’s own. Or probably the times were different then. Simple lifestyles, less complicated relationships, laid back attitude and foremost the zeal to really celebrate and be the part of a festivity! The robotic lifestyle was not in fashion then. People were less tired and had the enthusiasm to do things. Resources were abundant, loving was easy, living in peace and adjustments and a simple and humble life brought joy in our homes. Food, love curiosity and excitement, what else can a kid ask for during these eccentric times? Being in a joint family, every festival was celebrated in the most traditional ways. Every action was predetermined and had to be followed how it had been done since generations. In today’s world when we think that most of the traditions which were followed were nuisance and unnecessary, I still believe that it carried an old charm of its own with it. If we think then we can realize that most of the traditional rituals have been changed/ removed/ modified according to people’s need, surrounding and the availability of the resources. My parents always tried to include us in all the chores be it cleaning, buying stuffs for the celebrations, cooking or distributing. It was always fun to be a part of the festivity. As a new mother, I try my best to give my daughter at least a glimpse of what most of the festivals really mean to me and how much I have enjoyed celebrating it. I want her to grow up understanding the value, happiness, love, sharing and care which these festivities bring around. Of course, I can’t replicate what my parents and relatives did to make every festival look so alive and memorable. The amount of work and dedication which use to go in it, I really doubt I have it in me. But the good part is, I do try and cook a certain dish related to each festival or decorate or follow the rituals of every festival. If not the original at least the modified version. This year as I always do, I cooked Mutter Ghugni for Durga Puja and Thekua for Diwali. We also made the Diwali rangoli together. I try to show her and in the process let her contribute in her own ways. My daughter might or might not follow these rituals in her life. But I surely would know, that I have tried my best to show and make her understand and believe in spreading love, happiness, empathy and contentment in some way or other in whatever she choose. Don’t you in some way try the same? It was a warm, cosy, golden evening. The thousand golden beams of the sun was making our dusky skin glow in its presence. In that trance, soaking myself in that magical moment, I heard a faint voice of my mom saying – “How nice it is to see your small little kid playing in front of you. Soon they grow up, become independent and then leave. It is very heartbreaking to see them grow and then go. If only I could keep all three of you here. As my tiny kids you all once were. Giggling, dancing, hopping around and needing me all the time. Those were good old days. I miss them.” My heart stopped for a moment, I looked straight in her old wrinkly eyes and knew exactly what she meant. After all, I have become a mother myself now. I hugged my mom and thought, indeed we are a gift to each other. No doubt, the love and bonding between a mother and her kids are so divine yet so serene, so difficult yet so easy, so complex yet so simple, so giving yet so receiving. A good old twenty-four months back, I didn’t imagine writing this post. All I wanted, imagined, hoped and prayed in that insanity was that the day comes as fast as possible where my little one gets more independent and I get some time of my own. I thought then, my life would be easier and I would be hopping around in joy. As much as I have felt happier with her every step of independence, somewhere my heart knows that soon she would become fully independent and I might not be needed any more. Might be yes, at times, in certain situations/ circumstances, but not as it is right now! I cannot understand the sadness behind my this feeling. Why did my heart swell up seeing my daughter’s first steps, picking her own spoon, walking and running on her own, climbing and jumping without assistance and going to her school without the usual crying? Every time my heart has twitched a bit more. I remember crying for hours thinking of her “big achievements”. God! How I sobbed like a petty girl, on the first day of her school not having her around hopping and messing around with our plates, spoon and cups when me and my husband sat for our breakfast. I couldn’t eat anything and all I could think of was her. I swear, I had hated all those days when she would spill the tea, or drop the food fumbling while trying to lift it with the spoon. How I wanted to eat peacefully once in my life. But no, there I sat on my chair on that day, and all I thought and wished was her presence. How I wished to see the spilled tea and the dirty floor and that innocent smirky laugh! Isn’t it how it is suppose to be? My little girl is growing and is happy. Wasn’t this what I prayed for once? Then why does it hurt so much? The first time she refused to hold my fingers while taking her big steps on her own, refusing my help with a big smile on her face climbing on the bed, holding the spoon firmly between her fingers while trying to eat herself, opening the water bottle and drinking water on her own, getting ready for school without any reluctance, trying to hold her school bag on her own shoulders and then putting the blanket on mamma and herself while they both cosy up together! How fast the days went by. Sigh! Is this what it means when people say – “Enjoy it while it lasts?” Is this what motherhood really is? Trying to hold the moment in your fist as long as possible even while you want it to go? Just try to hold on to that moment, that small happiness, that tiny need, that feeling a bit more longer. And in those moments know that you wouldn’t be needed any more. The constant war between your heart and your brain of holding on and not letting go? Isn’t that heart wrenching? It certainly is! One thing is for sure. Motherhood has taught me that we woman bear a lot. What might seem stupid to a normal man could be a storm inside us. We enjoy and soak ourselves in each and every emotion. We let ourselves go. Get immersed in the sea of the insanity called motherhood and stay in that without breathing. And as soon as we start getting comfortable and start liking that feeling of being in that state, we need to come out of it bit by bit. We don’t know how to feel, good or bad? That’s what motherhood does to you. A big shout-out to all the moms out there. Love and hugs. Remember, you are not alone. I wonder and can not fathom still, when did you become so big? Did the time really fly or it passed across me in just a flick? then I see you looking at me giving that angelic smile, and your those tiny fluffy palms gently caressing me my love, makes me feel appreciated. If at all I was able to love you enough today or failed at it doing meagre complain? Could you please pass a bit slow and let me see my princess for a few seconds more? That angelic face, that mischievous smile, those curly hair, the tiny fingers which I love to adore? the chaos in this very moment is so real, I wonder how did the day get over or it just passed in a haste? All we will have is laughter, peace, solace, and the aroma of the first rains which will splatter. I love you my butterfly. You did great today! Legend says that the holy festival of Holi started with an innocent question of a curious Krishna who was teased by Radha and the other gopis for his dark skin color. Bewildered, he runs to his mother Yashoda and asks why she made him black while Radha was fair. This was pure injustice. He felt really sad about this. Yashoda, hearing this, chuckles and rubs turmeric paste on his sapphire color cheeks and sends him off saying that now his color has changed. The naughty Krishna then run and plucks some kala Jamun fruit for Radha and asks her to close her eyes so that he can feed them to her. Instead, he rubs the dark juice on her cheeks and hands and declares that she too is now dark. On seeing this, all the gopis of Vrindhavan gets overwhelmed with love. They fill their palms with fragrant oil, turmeric paste, fresh butter and start smearing each other’s faces and bodies. They fearlessly throw cheese balls, buttermilk, butter, curd, aromatic oils, and water mixed with turmeric, different fruit juices and Palash flowers extract at each other. Every devotee looked very attractive with their smiling faces and glittering white teeth. Their happy faces seemed more beautiful than the mighty Palash flowers. This incredible display of affection, love and devotion was enough to start the colorful festival of Holi. The nostalgic memories of this colorful festival always lingers in my mind. The hustle bustle of buying colors, pichkaari (water guns), new clothes to the big list of the grocery items everything was taken care with lots of care, enthusiasm and accuracy. This festival was something everyone looked forward to. Be it for the sumptuous food, family and friends getting together, exchange of gifts or smearing each other with gulaal or color. It was always a hit and never disappointed us in any way. We had a big joint family back then and everything was done in a grand way. The preparations for the festival would start well in advance and we would be gorging on the delicious food for at least a week. Apart from the memories, the other thing which lasted for a couple more weeks were the colors peeping through parts of our face, nails, palms and feet. The enjoyment did make us stand out in our school and each time a teacher saw us, he/she would ensure we are reminded of not studying enough 🙂 But, who cares. Huh!! Its Holi! I hope and pray that each one of you reading this now, your life gets filled with colors of joy, love, enthusiasm, optimism, faith and gratitude. You give and receive love with open arms. The joy and happiness never leaves your life and you can pass the harmony to others through your deeds. A moment which I can call aloud as my own, a moment where I could be known. I wonder how long will it last till the haunting will come back and not affect? I fathom of my long gone free spirit and what I didn’t want to be. I love you so much I’ll never be able to tell you; Probably I’m too frightened to tell you thinking it might not last. I hardly know myself, who am I? Am I a soul so tired, withered, falling hopeless, crumbling to pieces, drifting away far little by little, numb and dry? You will be there as my mighty armour, standing tall, rigid, unmoved, in-front of my inner demons, fighting.